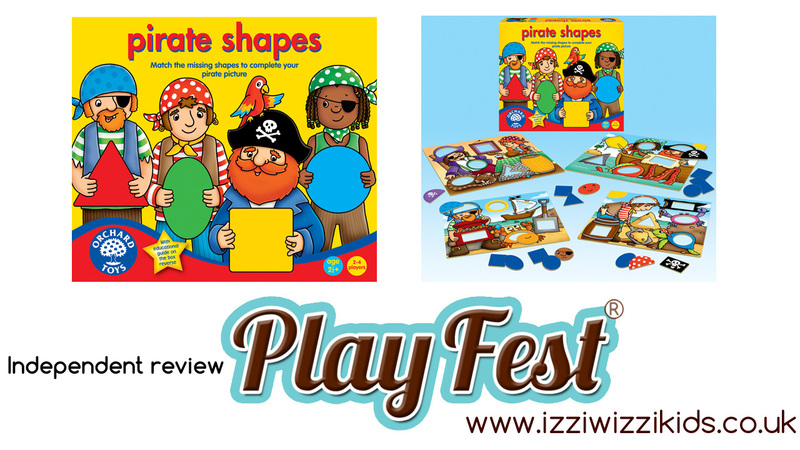 We have been lucky enough to review the Pirate Shapes game by Orchard Toys for Izziwizzi Kids Playfest. 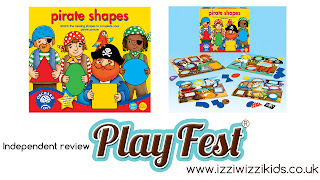 The Pirate Shapes game retails at £9.50. It is suitable for 2-4 players and the suggested age range is 2 1/2+. It is perfect for nursery or pre-school aged children who are learning shapes and colours. It teaches turn-taking and basic game play, and the concepts of winning and losing. Because you pick from a selection of upturned shapes the child has to pay attention to which shapes they need to collect, and then when they turn over the cards they need to compare their piece with the 'gaps' they have and see if it is the right colour and part of the picture to match with what they need to complete their board. Boy no.4, who is just 3, absolutely loves this game and has carried it around with him since we introduced it. He has chicken pox and it's making him feel secure and taking his mind off the itching. He's happy to enjoy it just as a collection of jigsaws, playing the game with someone else is a bonus! He's already become far more confident with his colours and has learnt the names for oval and rectangle, which he wasn't certain of before. Both my 3 and 4 year olds love this and it gets a definite 'thumbs up' from us. My gorgeous, lovely, delightful other half is kindly editing the video for me now, hopefully it'll be up by bedtime tonight, if not tomorrow! Lovely review, I found it interesting to see that Boy 3 found it really quite easy it seems. We need to get Boy 4 and Bud together for a Pirate Shapes marathon. I might just get this for Austin. He adores pirates, and loves the Orchard Toys dinosaur race game, which I bought him for Christmas. Another great review! Many thanks Jenny, and the boys, of course.